When the young slave Demetrios kills his Roman master and flees with his mentor and fellow slave Elazar, he believes he’s found freedom. But in creating a new life and a new identity, he quickly finds he’s as enslaved to the secret of murdering his master as he was to the master himself. A chance at love with a young woman is ruined by a glimpse into his mysterious past, and Demetrios and Elazar are forced to run again. Demetrios fears he is destined to be alone and wonders how he will ever find the freedom and love others enjoy if he cannot share the truth of who he is, or find forgiveness for his crimes. Demetrios soon discovers his trust in Elazar has been misplaced when Elazar reveals he’s confessed the murder to a so-called prophet named Jesus. Enraged by Elazar’s betrayal and desperate to keep his past a secret, Demetrios focuses his bitterness and fear on the prophet. He cannot allow this Jesus to alert the authorities, which could mean for Demetrios an arrest or execution. Demetrios must stop Jesus at all costs. When a second chance at love arises and Demetrios sees first-hand the work of this prophet, Demetrios must reconsider everything he believes. Should he continue to fight to keep his secrets buried, or should he risk his life to tell the truth to the woman he loves and ask for forgiveness? 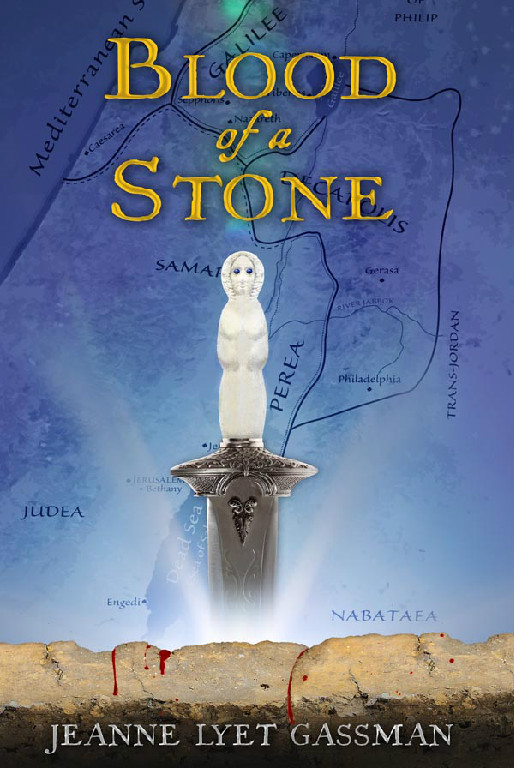 Set in first century Palestine, Blood of a Stone is a sweeping story of murder, betrayal, love, and the search for redemption. Ms. Gassman does a magnificent job transporting the reader back in time to first century Palestine. In the beginning it was hard to connect with Demetrios and easier, in some ways, to relate to Elazar. While I sympathized with Demetrios’ plight he often acted against Elazar’s sound advice and thus counter to his best interests. This was frustrating at first but as events progressed it dawned on me that, personally speaking, Demetrios represented life’s journey. From ignorance to awareness, not only of ourselves, but of the people around us and how we influence each other, like ripples in a pond. Some of those effects can be far reaching with lasting consequences we’d never imagine at the time. Our past acts, while perhaps not a grievous as Demetrios’, shape us and our future behavior. Whether we learn, grow, forgive, and move forward or allow them to haunt and burden us is, in the end, our decision. Demetrios becomes successful with a nice home but still lives in fear of his past catching up with him. It’s a two edged sword. In many ways he’s more empathetic and thoughtful but he isn’t happy, loved, or fulfilled. His past holds him in thrall. When Elazar betrays him Demetrios’ fear leads him to contemplate and go to great lengths to attempt even rasher deeds than the initial deed. Just what extremes is Demetrios willing to go to in order to keep his past secret? How much is he willing to lose? Will another death bring him the peace he seeks? BLOOD OF A STONE is moving, thought provoking, and at times, felt deeply personal. I sincerely hope this isn’t the last we hear from Ms. Gassman.